Yet, when you look through representations of the skeletal chap, in many cases death isn’t portrayed as frightening or scary, as clowns so frequently are. Instead, he’s made a bit of a joke of. When it comes to the blade toting, black cloak wearing, skeleton of our timely demise, we just don’t seem to take it seriously. Now, your average academic could probably storm into some kind of lecture about how this is all a defence mechanisms, laughing off our fears, mocking that which scares us most. And maybe that’s right. I don’t know, I’m not a psychologist, armchair or otherwise. 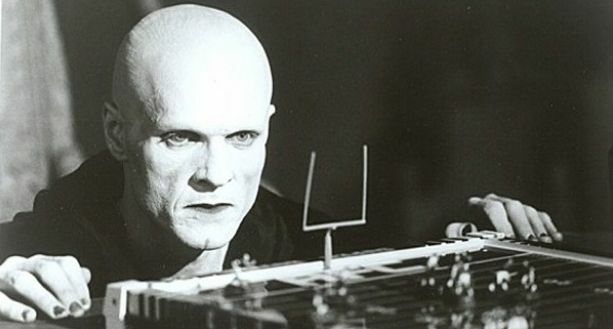 But what I do know is this: whether on the page or screen, death always delivers an entertaining performance. Feel free to come to your own conclusions of why we love to see the reaper brought down a peg or two. Here’s a few of the best around. Terry Pratchett’s Death had to be first. His sequence of Discworld books are arguably some of the best in the series. Pratchett crafted his reaper into an all powerful, yet highly flawed character, who falls frequently into an existential crisis and abandons his post. 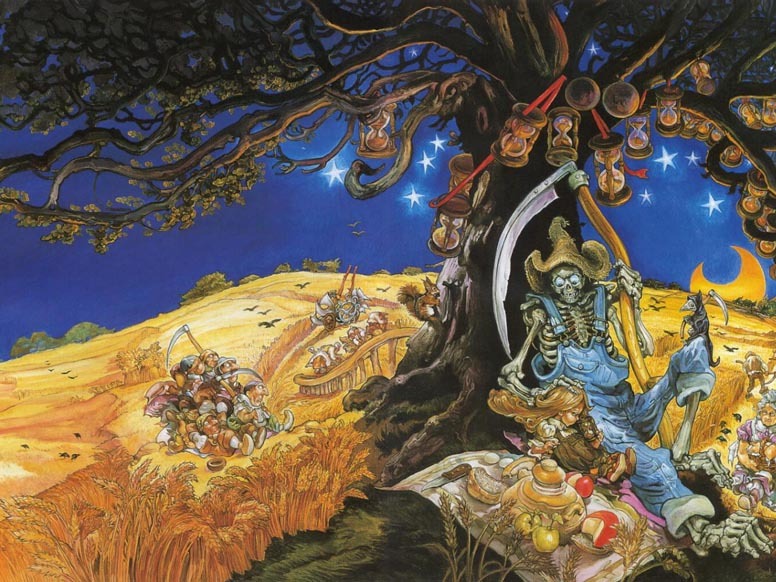 Out of all the grim reapers looked at here, Discworld’s death is at least probably the most powerful and feared by the other characters. Yet he’s still not something to be particularly afraid of. I mean, how do you start fearing a grim reaper who gets demoted to wearing dungarees because he ‘has too many feelings [see/read ‘Reaper Man, the second in Discworld’s death series]. The poor schmuck of a reaper in the second (most excellent) Bill & Ted film falls prey to the pair’s shenanigans. Unlike the infamous grim reaper from Seven Seals, who he parodies and who really was quite intimidating, he isn’t up against a chess fan. Instead, forced to engage with the two buffoons in Twister, Battle Ship and other less glamourous games, he gets duped into helping the guys out. There’s been a few sitcoms that have brought death into the foreground, but the two that did it best were Dead Like Me and, obviously, Reaper (below). There must have been a scythe hanging over both of these though, because they were both cut disappointingly short. For the uninitiated, Dead Like Me follows a Georgia who, after being killed [by a toilet] becomes a reaper. But there’s not black cloak, skeletal features of scythe here. Just a motley crew of fellow reapers, led by Rube, arguably one of the series’ strongest characters. 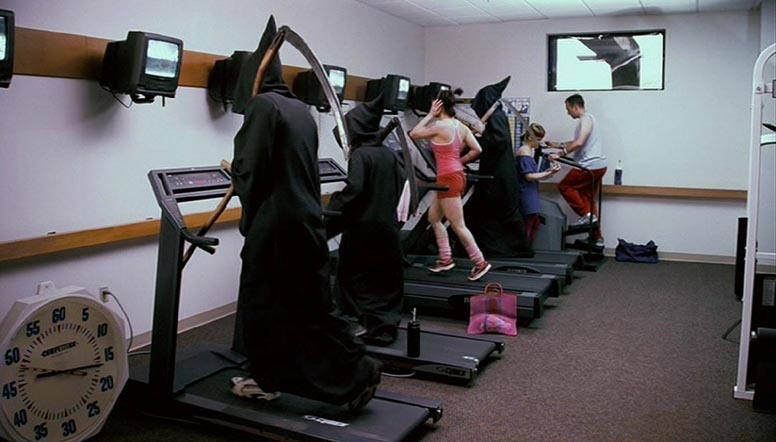 Death, or deaths as it is in Dead Like Me, are far from all powerful. As reaping doesn’t pay, they each have to work a separate job, while doing their reaping duties on a extra-curricular basis. The scariest thing about these reapers is the tedium and bureaucracy they’re dragged through on a day to day basis, while clearing up the souls of the deceased. 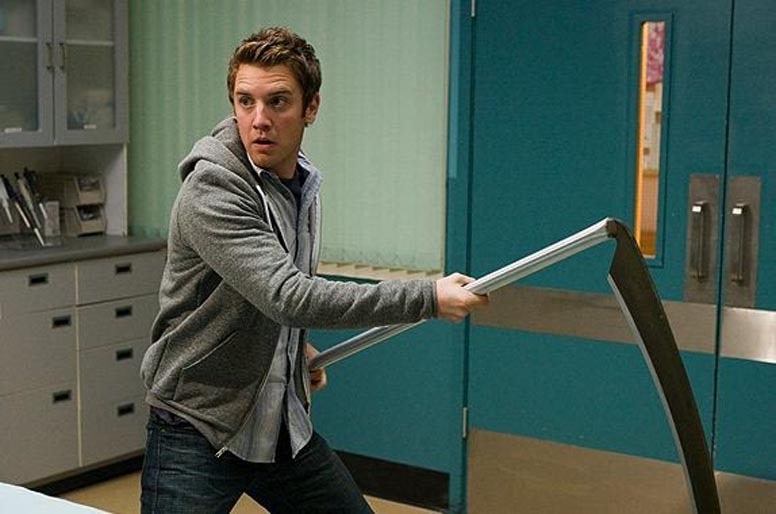 While the core group of reapers in Dead Like Me are dysfunctional, none are quite as hapless as Sam, the reaper of Reaper. Forced to do the devil’s bidding – played incredibly by a sinister Ray Wise (Twin Peaks) – Sam and his buddies are assigned a soul to collect, which Sam’s contractually obligated to retrieve. 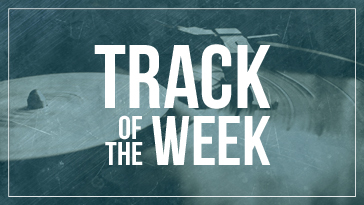 Forced to quit slacking off at their day job in a DIY store, the trio consistently bungle their way through the seemingly simple task of reaping. If only death were this inept, we might all have nothing to fear. 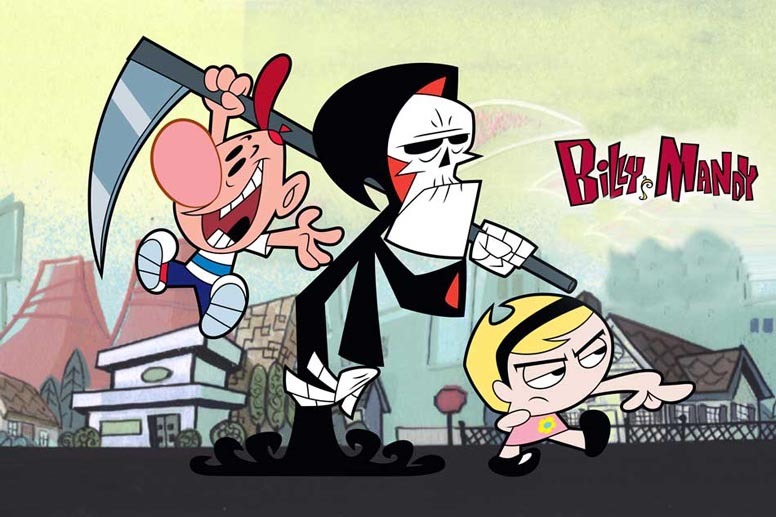 Grim of Bill and Mandy’s world fails right off the bat. He first appears to take away their dead hamster. Why’s he even worrying about hamsters? The death of Discworld certainly doesn’t, that’s what the Death of Rats would be for. But for some reason, Grim is duty-bound to collect this hamster. Cartoons being cartoons, he doesn’t. Nope, instead he’s bested by a pair of children and forced to be their slave/friend. Again, it’s hard to fear the reaper when he’s this much of a pushover. The most baffling part of Grim’s character though is the unexplained Jamaican accent. Possibly it’s down to all the jokes they make about him loving limbo (get it? ), but who knows. Fact is, he gets chumped by a couple of kids. There’s nothing to fear here. It’s hard to imagine many people haven’t seen Monty Python’s infamous death scene from The Meaning of Life. The great thing about Python’s death is that they kept the character very traditional, slow, ominous, easily one of the more threatening reapers on this list, building up some real tension as he approaches. Even after that suspense is broken with the punchline, the vision at the end of him walking the deceased away makes the sketch genuinely chilling, leaving you laughing uncomfortably as the phantom takes the souls away. 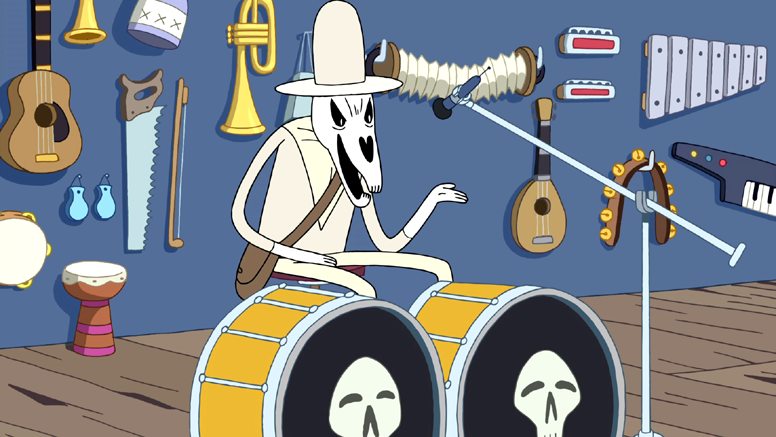 Unlike many of the other depictions of death above, Adventure Time’s reaper isn’t kitted out in the traditional grim reaper get up. Instead he’s sporting a swanky white suit, hat and boots, like a Texan oil baron. Holed up in a kind of hell dimension and surrounded by the dead, the Finn and Jake encounter a death who, while powerful and threatening, is still not immune to the protagonists’ antics. Even more problematic for this reaper is a little thing called love. He’s in it and it’s bringing him down. Better make a mix tape. Welcome to the High Fidelity of reapers. The death of Sam and Dean Winchester’s world is one of my favourite portrayals of the reaper. 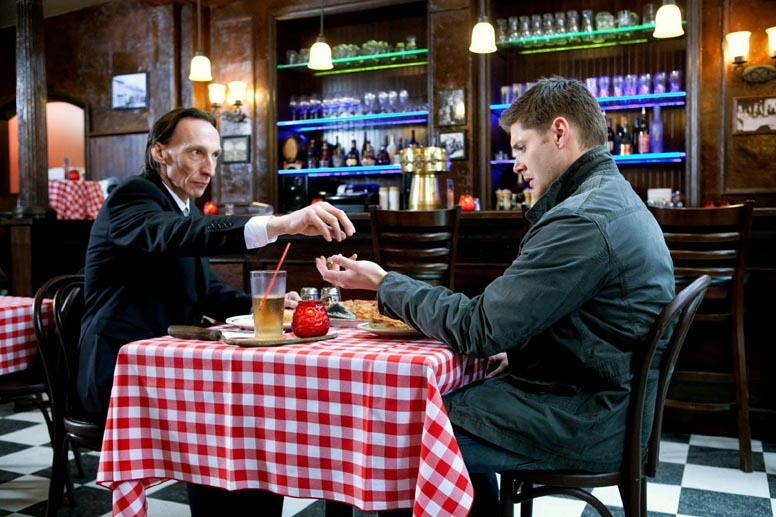 Originally appearing as one of the four horsemen, naturally, Julian Richings’ version is smart, clad in a black suit. He’s calm and logical, but at all times maintains and air of power and imminent threat. Though that threat level is frequently brought down a peg or two by his unwavering fondness for good old junk food. As with many of the deaths in this list, he finds his downfall in a hapless pair. What is it with duos making a mockery of death? That aside, he deserves probs for having possibly the best intro of any character in (sort of) recent TV.